Shop a huge selection of merchandising fixtures, displays, and accessories. Custom-made, personalized and value engineered solutions, from concept to completion. We are a leader in reliable customer service, in stock inventory, and the lowest prices in the store fixture industry. Shop a selection of over 2,500 merchandising fixtures, displays and accessories. Our in-house team offers full-service solutions from concept to completion including custom-made, personalized and value engineered projects. Serving customers and industries around the globe, from automotive, apparel and sporting goods to gift shops, museums, schools and theme parks. 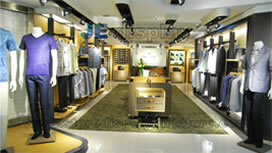 Shop an extensive selection of merchandising fixtures, displays, accessories and more. We are a leader in reliable customer service, in stock inventory, and the lowest prices in the store fixture industry. We provide retail fulfillment services that include packaging; compliant barcode/parcel product and carton labeling for EDI fulfillment and routing requirements; case, and loose, pick programs; truck scheduling; and more. From the beginning design and renderings to material selection and prototypes, our in house team makes the manufacturing process easy and affordable. Our expertise in fulfillment for retailers and brand marketers helps minimize chargebacks, and favorably impacts your overall profitability. 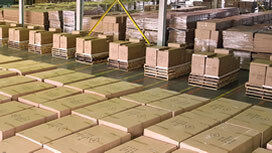 Our warehouse inventory systems can be customized to support the needs of all custom requirements. Contact us to learn more about how we can create a custom retail fulfillment package for you. Starting with product design and quality specifications, we work with you to develop the best manufacturing method, a schedule and cost estimate based on your budget and timeline. From there it's on to product development, prototypes, inspection and finally manufacturing. 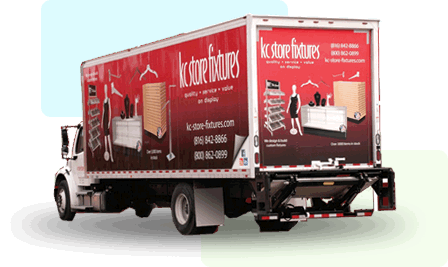 Kansas City Store Fixtures is a leading online distributor of retail and display fixtures. We are a U.S. manufacturer and a direct importer providing you with the best prices on the widest selection of retail displays. At KC Store Fixtures we offer a variety of retail fixtures to ensure the best solution for your store environment. Whether you are looking at opening a new store, doing a remodel or making some merchandising updates we have the knowledge, store fixtures and selection to meet your needs. If you are looking for a way to merchandise a new clothing line, jewelry, or just organize your products, we can help.